Successfully Added Solar Powered Digital Tire Gauge to your Shopping Cart. Solar Powered Digital Tire Gauge. 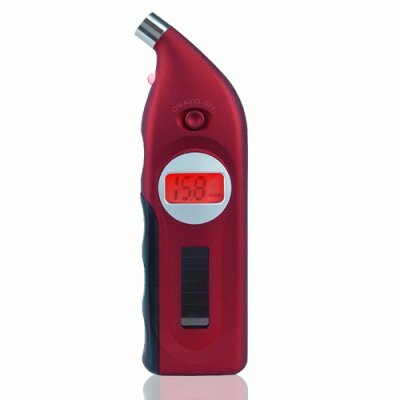 Car gadget tire gauge with a digital LCD display and a built in solar panel for recharging the built in lithium batteries. This eco-friendly solar powered car accessory is a perfect way not only to extend your car tires life span, but as a safety device to see if the tire is at dangerously low level. Off of the backlit LCD screen, Psi, Bar, Kpa, and Kg/cm2 pressure settings can be selected and seen, and with the built in extendable depth ruler, checking the tire tread is fast and easy. This multi-tool digital tire gauge is a great idea for keeping your car and tires in good order, and at the same time helping preserve the environment, and is available direct from China with free dropshipping from Chinavasion. on 2010-04-10 19:41:14 Very good. Got 5 of these and they work well. Great as gifts for family members etc. Good having the different pressure readouts, as different vehicles I have, list the pressures with different units of measure.